The use of chemistry in archaeology can help archaeologists answer questions about the nature and origin of the many organic and inorganic finds recovered through excavation, providing valuable information about the social history of humankind. This textbook tackles the fundamental issues in chemical studies of archaeological materials. Examining the most widely used analytical techniques in archaeology, the third edition of this comprehensive textbook features a new chapter on proteomics, capturing significant developments in protein recognition for dating and characterisation. The textbook has been updated to encompass the latest developments in the field. The textbook explores several archaeological investigations in which chemistry has been employed in tracing the origins of or in studying artefacts, and includes chapters on obsidian, ceramics, glass, metals and resins. 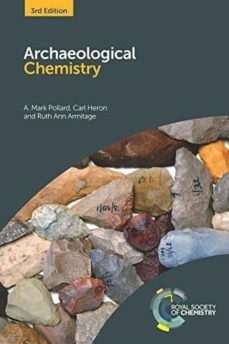 It is an essential companion to students in archaeological science and chemistry, as well as to archaeologists, and those involved in conserving human artefacts.